Carter Kane and his younger sister Sadie will once again match wits and magical powers with the gods of ancient Egypt in the second book in Rick Riordan's The Kane Chronicles series, Book Two: The Throne of Fire. The book won't be released until released May 3, but here's an exclusive look at the opening chapter. 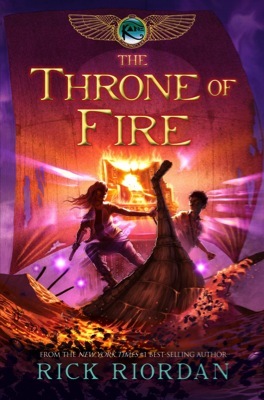 The second book in The Kane Chronicle series officially has a cover! I have to say that us Lonestars adore Rick. He lives in San Antonio and makes his way around every time a book comes out. He is great with the kids and I think he may hold the record for signing the most amount books in the shortest time period. Last at year at TLA, people were snaked around the exhibit hall waiting in line at his signing. It was an incredible sight!